Nestled within the deep hidden valleys of New Zealand’s Forgotten World Highway is the ultimate way to explore rural New Zealand. 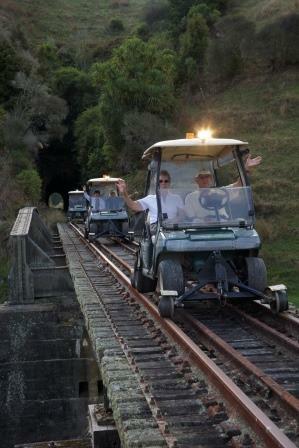 Travel along decommissioned railway lines, through tunnels, over bridges and rivers and to townships that time forgot. Experience the Forgotten World from the comfort of a rail-cart, cleverly adapted to be self-driven along the tracks of the Forgotten World railway. There are plenty of photo opportunities along the way while taking in ever-changing vistas with our semi guided NZ rail tours.